Due to weather & potential for flash floods this weekend we must cancel this year’s Ride for Tyler. If you preregistered you will hear from us in an email. We are sorry to have to cancel but Hurricane Joaquin will be raining down pretty heavy on north Georgia. Y’all stay dry and safe and come see us at the Grand Opening of the Tyler’s Way Trail on November 8th. The 3rd annual Ride for Tyler was on Sunday, September 28th 2014. This was a motorcycle ride and poker run through the North Fulton area. Riding with friends, meeting new riders and enjoying a beautiful day are all ways to Love, Laugh and Play in Tyler’s memory. To those of you who joined us, Thank you!. A big thanks to 37 Main in Johns Creek. The 2nd annual Ride for Tyler was on Sunday, September 22nd, 2013 and was a great success! We had over 40 riders on a very beautiful day! Thanks to all our volunteers and riders for your support! 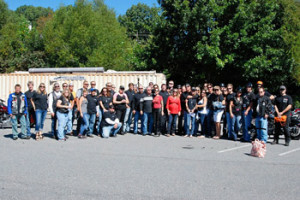 The ride began at Killer Creek Harley Davidson in Alpharetta. The poker run had several fun stops for the riders. Thank you again for riding with us to Love, Laugh, and Play in Tyler’s memory. 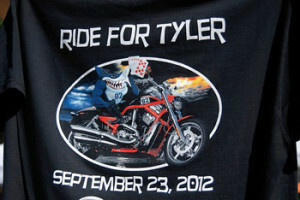 Our 1st annual Ride for Tyler was held on Sunday, September 23rd, 2012 at Killer Creek Harley Davidson in Alpharetta. The ride was a poker run through the North Fulton area. We are very thankful to all or our riders and sponsors. We were blessed with a beautiful sunny day and a safe and enjoyable ride.